Coltsfoot (Tussilago Farfara), an herb growing wild in Europe and North America; found in this country in the northern and middle states. Though the whole plant is used, its virtue is principally in the- leaves. These are gathered and dried, and used generally in the form of a decoction. 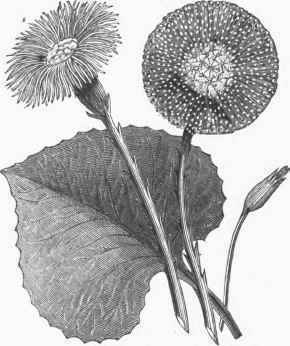 Coltsfoot is employed in pulmonary complaints, as a demulcent, often in the form of cough candy. It is said to have been smoked by the ancients in affections of the lungs. Columbia, a city of Lancaster co., Penn., situated on the Susquehanna river, at the terminus of the Philadelphia and Columbia railroad, and of the eastern division of the state canal; pop. in 1870, 6,461. The Columbia branch railroad connects it with Harrisburg, and another with York and Baltimore. It is the principal depot of the lumber which is rafted down the Susquehanna. There are two weekly newspapers and several churches. Columbretes, Or Colombretes, a group of small islands in the Mediterranean, belonging to Spain, about lat. 39° 54' N., lon. 0° 44' E., 29 m. S. E. of Cape Oropesa. They are of volcanic origin, and very picturesque, their broken masses seeming like the fragments of a larger island. There is deep water between them, and a deep and capacious harbor in the largest island, Santa Maria de Columbretes. On this island there is a hill of some elevation called Monte Oolibre. The surface is much broken, and exhibits lavas and scoria, but there is an exuberance of dwarf olives, geraniums, prickly pears, myrtles, and brushwood, and crops are raised of rye, maize, pulse, potatoes, and hemp. The island swarms with snakes, which seem to be harmless. This group is important as a military station. Colusa, a N. county of California, bounded E. by the Sacramento river and W. by the Coast range of mountains; area, 2,376 sq. m.; pop. in 1870, 6,165, of whom 271 were Chinese. Several streams rise in the Coast range, but sink before reaching the Sacramento; Stony and Sycamore creeks traverse the county. Quicksilver, sulphur, and salt are found. The soil is fertile. The chief productions in 1870 were 701,174 bushels of wheat, 386,468 of barley, 11,214 tons of hay, and 1,086,599 lbs. of wool. There were 5,905 horses, 2,666 milch cows, 19,368 other cattle, 175,963 sheep, and 33,540 swine. Capital, Colusa. Comacchio, a fortified town of Italy, in the province and 28 m. S. E. of the city of Fer-rara, 3 m. from the Adriatic; pop. about 6,500. It is the seat of a bishop. The chief occupation of the inhabitants is pisciculture. A series of canals has been constructed to connect the lagoon in the midst of which the town is situated with the Adriatic, so as to admit the fry of the eel, the mullet, the sole, and other fishes into the lagoon, where they are fattened. The annual product now averages 1,000,000 lbs. The manufacture of salt is also of importance, about 2,000,000 lbs. being obtained annually.